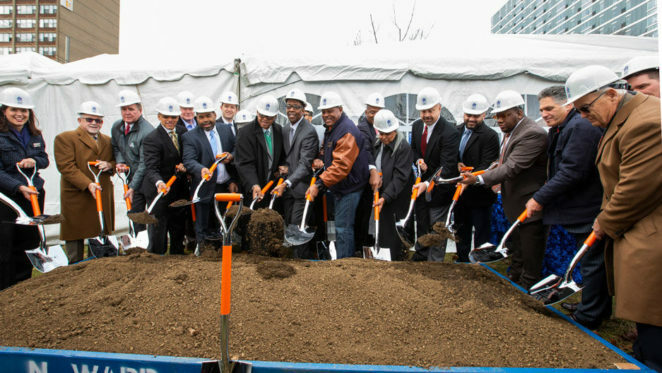 The Laborers’ District Council (LDC)—the only majority black buildings trades union in the city—held a jubilant groundbreaking ceremony for a $22 million, 66,000-square-foot training and learning center Dec. 6. The three-story facility at Broad and Thompson streets, which borders Temple University’s soccer field, will provide technical training geared toward the next generation of professional construction craft laborers. Temple University will serve as an educational partner at the center to increase learning opportunities for LDC members and the surrounding community. “Being just blocks away from each other presents a greater opportunity to align our workforce development efforts,” said Shirley Moy, who leads Temple’s Lenfest North Philadelphia Workforce Initiative. Moy said she’s excited about the center’s proximity to neighbors and the increased potential of connecting them to the building trades. Bill Bergman, Temple’s vice president of public affairs, agreed. Representatives from labor and local government underscored the importance of bringing the LDC, which until now has conducted trainings in the suburb of Exton, into the heart of the city. “We need this more than we need fresh air,” said Patrick Eiding, president of the Philadelphia Council AFL-CIO, which represents more than 100 local unions. “When I was told that there was some conversation about bringing [the LDC] to this location, I said, ‘When can we start digging?’” said City Council President Darrell Clarke. Clarke pointed out that this is the latest of several major developments on North Broad Street, including the Divine Lorraine, which reopened in 2017, and the Met, which reopened Dec. 3. Samuel Staten Sr., a local labor leader who passed away in 2016, was said by many to be looking over the groundbreaking in spirit. The building will be named for Staten’s son, Samuel Staten Jr., who, like his father, found the stability of both employment and leadership in the building trades.